..OK…so the first rule of thumb with a G9 camera from Canon is..CHECK THE BATTERY STATUS first…it loves the juice…..
After a false start, due to to the above fact learned the hard way!!! I came home and decided to use it where I would normally use my BIG GUN camera. This is fine for me here since my final intention was to produce the result on the web rather than on a page..(yet to be tested). 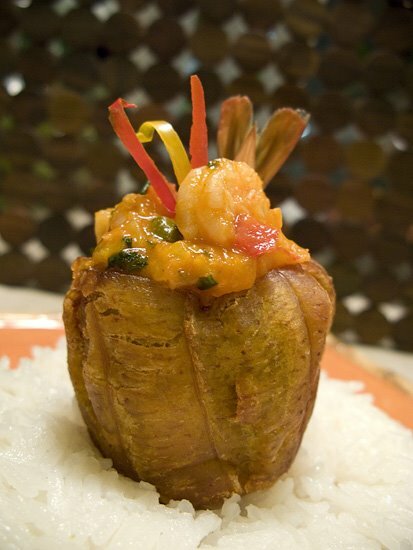 I shot this image,”Cilantro Shrimp in Plantain Cup” hand held, under a low lighting condition. The anti shake feature came on automatic and the result in Raw seems fine. I also shot a small jpeg with to see how the camera program would interpret it, which it also did very close to my taste. My next trial will be on an assignment…. 14 Apr	This entry was written by MiamiVisual and published on 08 at 12:16 am. It’s filed under MVC Blog Post. Bookmark the permalink. Follow any comments here with the RSS feed for this post.